A fabulous 19th century *Edwards & Roberts Side Cabinet of superb quality, as you would expect from this renowned English maker. The cabinet having a moulded top with a panelled door, original knob handle and raised on a plinth base. The door opens to reveal a deep drawer and single shelf. 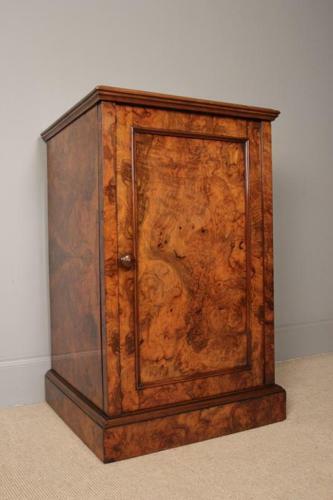 The cabinet with wonderful figured walnut to the top, front and sides, with excellent mellow colour and lustre. A Generous height to the internal shelf, comfortably houses large arch lever files. The cabinet stamped "Edwards & Roberts" to the top edge of the door. *Edwards & Roberts was founded in 1845, and had premises at 21 Wardour Street London. By 1892 they occupied more than a dozen buildings in Wardour Street, where they continued to trade until the end of the century. They became one of the leading London cabinet makers and retailers.